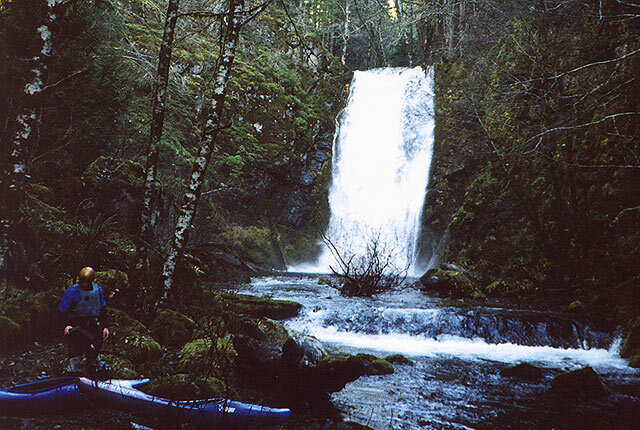 Siouxon Creek (pronounced soo-sun) has been on our 'to-do' list of Washington creeks for a few years now. In 2000 I was recovering from my broken back and we had the drought to contend with, so we put it off until 2001. Finally John Whaley and I decided to run this creek (which is the sister creek to the more famous and often run Canyon Creek.) in November of 2001. Siouxon has been run before, probably for the first time by Scott Matthews back in the eighties. John called Scott and got some sketchy beta on the location of the class six drops on this creek, and after poring over the topos for a couple of days we hatched a semi-cunning plan to run the entire ten miles of Siouxon, top to bottom, without running out of daylight. The main obstacle on this run is access. The take-out requires a four-mile paddle out across a reservoir followed by a half mile hike back to the car, and the put-in isn't much better. Of course, we actually LIKE runs like this.. To us, bad access just means you have to be more fit, more disciplined, and more focused in order to complete the run in one day. We met at 5 a.m. in South Portland and headed north at a high rate of speed. We were very concerned about running out of daylight, and after doing so for two weekends in a row on Quartz Creek and in the Salmon River Canyon, I did not want to repeat the experience anytime soon. After the Salmon Canyon debacle I had thrown out all of my old, broken headlamps and purchased a monster halogen headlamp that was waterproof to 1000 feet and had a beam so strong I was pretty sure it would cause radiation burns if directed at exposed flesh. We arrived at the take-out below Yale Reservoir before daybreak and were dismayed to discover that the road to the reservoir was gated. Undaunted, we got out and jogged about a half mile down to the lake in the dark so we could be confident that we would be able to recognize the take-out. After picking out landmarks we jogged back up to the car and cross-loaded gear onto my car and hit the road. The shuttle was the worst I have ever undertaken. We drove up Canyon Creek and then entered a maze of logging / forest service roads that seemed to branch off in every possible direction. Luckily John had his forest service map along with him because we took so many turns that both of us got a little disoriented, even with the usually reliable Gazetteer. The road soon climbed up onto a 3000 foot ridgeline, treating us to spectacular vistas as the sun crept over the horizon. It was still hunting season, and of course the roads were swarming with big trucks crammed full of brightly-dressed hunters armed to the teeth and lusting for blood. Now, I don't have a problem with hunters per se, but I get mighty disagreeable when I encounter some of the stuff we saw that morning. As the sun rose over the mountains we caught up to a truck that was creeping very slowly along the road, bristling with rifles. It was obvious to even the most casual observer that these so-called 'hunters' were road-hunting, which is totally illegal and unsportsmanlike. "Look at these #$@# @#$@#.." I growled to John. "The worthless bastards can't even be bothered to get off of their lazy asses and hit the woods; they're hunting from the road! This really pisses me off!!" John had a few choice words to say as well, and soon the truck eased over to the side of the road and I tore past them. About two hundred yards up the road we rounded a corner and saw three huge elk, one bull and two cows, all standing in the road and looking very surprised. The Bull was enormous, and they were caught in the open, with clear cuts on either side. I immediately (and somewhat gleefully) laid on my horn as we tore up the road at top speed. The elk leapt off the road and took off through the brush at a full charge, quickly disappearing into the treeline. I was so happy that I had screwed over the despicable morons in the truck we had passed that I kept honking my horn periodically for the next five or so miles, ensuring that they wouldn't see ANYTHING from the warmth and comfort of their truck. Neither of us had any illusions about what would have happened if the hunters had come across the elk before we did. Soon we reached the pass at 4000 feet and started dropping down on the other side. We had a great view of Mt. St. Helens, and soon we took a sharp left onto Siouxon Road. At this point we had been driving for over an hour and we were dreading the thought of re-negotiating those roads when we were finished with the run. Siouxon road had a few bad spots but my car made it through until finally the road came to an end at a large clearing. Ahead the road was blown out, and from the clearing two other roads branched off, one headed north and a smaller, less used road headed south. We got out and checked the map, but we were not totally sure that we knew where we were. We hiked up a short hill to where the road had been blown out by an enormous, quarter-mile wide landslide. Far below and to the north we could see what we thought was Swift Reservoir, so we were fairly confident we were on the right ridgeline. On the other hand, we were a little confused by a road that took off to the north just before the washout that wasn't on the map. "I don't know." I said. "Do you think we should have gone straight back there instead of taking that right hand turn?" We consulted the maps again and eventually decided that we were 80% sure that we were in the right place. The smaller, slightly overgrown road that was headed south looked like it might be the road that dropped down alongside Chinook Creek on the map. If we were right, then after about a mile or two the road would end with the Chinook Creek trailhead. Now that we were committed we started to drive down the small road but were quickly repelled by some huge ruts in the road. I'm sure a four-wheel-drive vehicle could negotiate these obstacles, but not my car. We backed up to the clearing and parked there. We headed down the road, running for much of the first mile or so. So the road steepened and we saw a trailhead marker. "Yeah!" John yelled and we took off down the trail with renewed vigor, hoping to get to the creek as soon as possible. However, the trail soon narrowed and our progress slowed. Soon we heard a creek rushing down in the gorge to our left, which we decided had to be Chinook Creek. From our vantage point a hundred feet above the creek, Chinook looked really good. It was totally bedrocked out, and it looked like a continuous series of ledges and slides. There was probably about a hundred cfs in the creek, and we were sorely tempted to put on Chinook and paddle it down to Siouxon. However, we knew we had at least ten miles of Siouxon to paddle, including the paddle out and we had some time concerns. After short debate we continued down the trail, with a few wistful glances down into Chinook whenever we could see it through the trees. 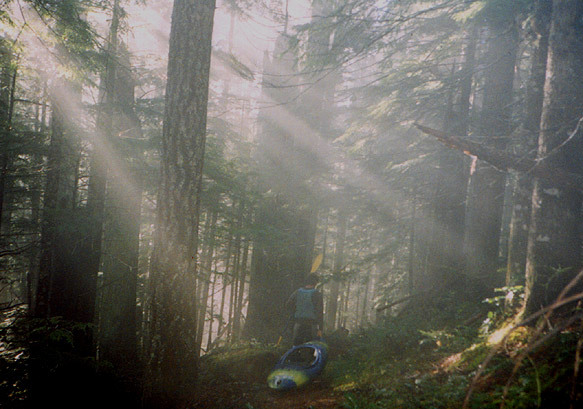 It was a little foggy, and the sunlight streamed down through the trees in long beams of ghostly white light as we dropped down into the Siouxon Creek watershed. John, a couple of miles into the hike to Siouxon. Chinook Creek gorge is on the left side of the trail here. Soon we reached a fork in the trail and we split up to scout. It turned out that going left and downhill was the best way as that trail led to the base of a forty foot falls on Chinook Creek. John had hiked to this point years before, and he pointed out where the trail crossed the creek and continued down to Siouxon Creek. He said that Siouxon was about a quarter mile or so downstream from here, and we were happy that we would be able to paddle down to the confluence. Putting in below the forty footer on Chinook Creek. We put on Chinook Creek and paddled about a hundred feet before the creek zipped around the corner and dropped over a horizon line between vertical walls. "Wow." I said as we sat in an eddy just upstream. "We're getting a little bonus here.." John went down and swung into an eddy right at the lip, and then peeled out and dropped out of sight. I followed, dropping over a totally clean ten footer into a pool below. Just downstream the creek dropped over another twisty ledge, then we reached a three-tiered fifteen footer that was really sweet! John runs the last part of the three-tiered drop just above the confluence. Once on Siouxon Creek we looked up and saw that we were at the bottom of a gorge. We got into an eddy and looked upstream and could see a footbridge crossing the gorge. John was a little worried that we were actually missing something by putting in below the gorge, but once again our time constraint prevented us from hiking upstream with our boats to find out. Soon we reached a horizon line and got out to scout. I was thrilled by what I saw and was soon back in my boat, bombing down a series of four riverwide ledges spread out over a hundred yards. This was a great rapid. 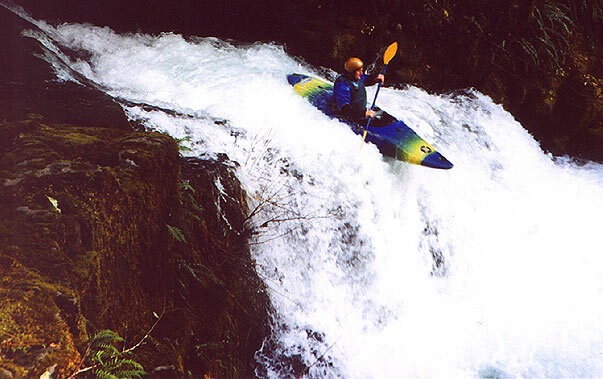 John, halfway down the first major rapid below the confluence. The first drop, in it's entirety. Below this series of ledges the creek mellowed considerably and became class II-III for the next couple of miles. Soon we faced another horizon line, which turned out to be a ten-foot double ledge drop. Just downstream from here we encountered an enormous horizon line and we got out on the left, hiking up onto the trail to scout. It was the first class six drop, Siouxon Falls. This drop is totally runnable, but with an estimated 500 cfs going over it this thing was stomping! Either way, it was too big for either John or myself to consider at probably any flow, so we portaged on the trail and climbed down from the trail once below the falls. 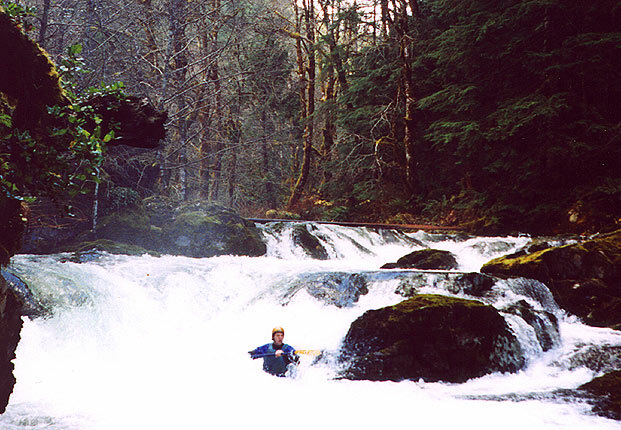 John, dwarfed by the first class six falls on Siouxon Creek. Below Siouxon Falls the creek was pretty mellow, and the miles rolled by without any major rapids. Every so often there would be a class III drop, but nothing stood out. The creek was scenic, but mellow. Soon we reached our first logjam portage, and of course the logs were stuck in the most inconvenient spot imaginable, a short, vertical-walled gorge that forced us to do some creative portaging up and over the jam at creek-level. This took some time, but we were soon headed down the creek again. Downstream was more class II-III stuff, nothing too memorable, and then another logjam, also in a mini-gorge that forced some more creative portaging. "Man, if we have too many more portages like this, we're in trouble." I said as paddled off downstream. Luckily the creek remained remarkably wood-free below here, and we continued downstream at a good pace. Soon we reached a sizable horizon line and I started eddy-hopping down, trying to ascertain whether we could boat-scout the drop. As I neared the lip of the drop I caught a glimpse of a dark, tight gorge far below and a roar that sent chills up my spine. I quickly caught an eddy on the left, and John stopped as well. We got out to scout, and what it spectacle it turned out to be! Below us the creek roared over another huge drop. The first part was a fifteen foot ledge into a thirty foot long, steep slide that powered into the left wall with tremendous force before turning right and dropping over a series of smaller drops that ended in a couple of river-wide logs in a vertical-walled gorge. This drop would probably be runnable if the wood wasn't in the gorge below, but if you didn't stay right the first part of the drop I don't think you would be alive by the time you got to the wood anyway. John contemplates Lower Siouxon Falls. The drop keeps going around the corner. The left wall here is a real meat grinder, and puts the drop at solid class V+ to VI even if there wasn't any wood in it. If you look very carefully you can just see the large log wedged in the gorge below. After marveling at this awe-inspiring spectacle for awhile we turned and began to contemplate the thick stands of Devil's Club that were lining the walls of the gorge. 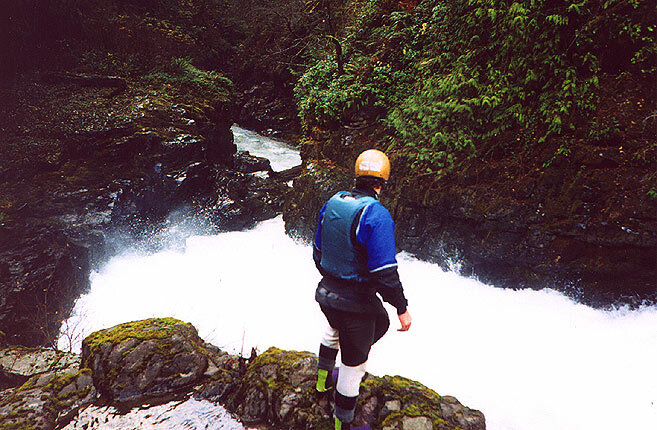 "This is going to be interesting.." I muttered as I started up the slick, muddy slope above the falls. Have you ever had to deal with Devil's Club? This most appropriately named plant thrives along the banks of some Northwest Rivers and Creeks, and many a paddler has had painful encounters with it. Devil's Club usually stands about two feet tall and had broad, long leaves. The entire stem of each plant bristles with long, thin thorns that are positively evil. When you brush by the plant (or god forbid you grab one by mistake) your hand will be filled with tiny black thorns, all of which break off under the surface of your skin. Usually the only way to get the thorns out is to wait until they become infected, at which point you can remove them, one by one. After groveling my way up through thirty feet of dense Devil's Club, I started traversing along the rim of the gorge, plowing through the thick, jungle-like underbrush, crawling over the smaller logs and burrowing under the larger ones. I soon found a ghostly game trail which allowed me to quickly outdistance John, who I could hear crashing through the undergrowth somewhere behind me. After moving about a hundred yards downstream the game trail took an abrupt turn and headed back down into the gorge. By now John had caught up and this was what we had been looking for, a spot where the animals went down to drink in the creek. Sure enough, there was a way down, but it was so steep at the bottom I sat down and slid down the last forty feet of muddy slope.. 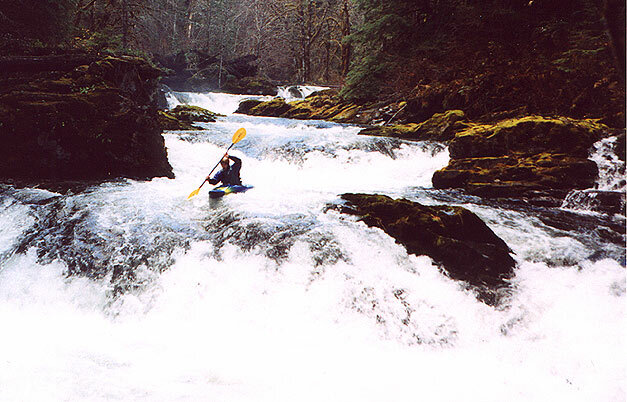 Soon we were back on the creek and we started charging downstream again. The last major rapid consisted of a class IV boulder garden that led into a mini version of Wishbone Falls on the Little White, and below that the creek mellowed considerably. At this point we were a little concerned that we were going to run out of light. We still had about three miles of creek to paddle, followed by four miles on the reservoir. Just then we rounded the corner and saw a narrow bridge across the creek. As we bounced down the small rapid above the bridge, a car drove across the bridge overhead. I blinked, not quite believing it. Sure enough, there was another car parked on the side of the road next to the bridge! "You gotta be #@@$ kidding me!!" I said as I pulled into the eddy below the mystery bridge. "What road is this? This isn't on the map!!" John shrugged, mystified. We could have taken out here, and saved seven miles of paddling! Actually, the lower few miles were pretty fun, especially below the confluence with the North Fork of Siouxon. This almost doubled the flow, and the creek had a nice big-water class three feel, with lots of waves and places to surf. I must admit that I indulged in a little hole-surfing in order to try and increase the fun-factor for this run, which was pretty much zero at this point. Soon we hit the reservoir and started the long slog out. The sun was going down as we raced across the lake, but the sky was crystal clear and we had a spectacular view of Mount St. Helens bathed in sunset pink as we finally arrived at the take out. We were determined to be totally finished before dark, so we immediately shouldered our boats and hiked the final quarter mile back to the truck. Just as we finished changing, we ran out of light. I must admit that after running out of light the last two weekends running, it felt pretty good to break my streak! The drive back to my car was horrible (of course). It took two more hours of winding up the web of logging roads until finally we reached the clearing and my car. It was now very cold and I had to scrape ice off of my windows, but we were relieved to be finally headed home. We ended up taking a back way out that put us on the upper Wind River, which probably saved an hour and a half of back-woods driving on bad roads. 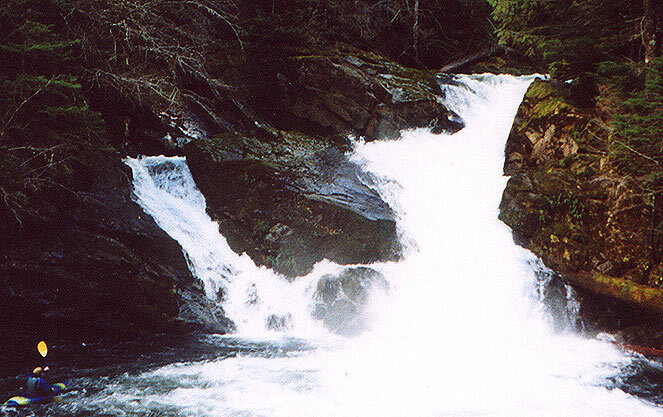 FLOWS AND ACCESS: The best way to run this creek would be to hike upstream above Siouxon Falls. There is a short gorge above where we came in on Chinook Creek that has a 20 foot falls and a 10 foot ledge mixed in with some other stuff, so if you hike up that high and take out at Siouxon Falls you will probably have a very good time. That said, if you continue down below Siouxon Falls, you will probably regret it. The creek is 90% class II-III, with multiple portages. When we ran Siouxon the EF Lewis at Heisson gauge was at 1200 cfs. This translated into about 400 cfs on Siouxon, which was a nice medium flow. Given the wide, ledgy nature of this creek, a low water run would probably be pure misery.